1. Clearly define the expectations of any learning and development initiative. Whether you are developing a program internally or partnering with an external expert, it is critical that you identify your expected outcomes. General statements about stronger leadership, better communication or more effective time management won’t do it. Define expectations as you would when writing a performance goal for your company or an individual. Use the SMART system of goal setting, insuring your goal is specific, can be measured, is achievable, realistic given your current environment and tangible. What would your employees be doing or saying that would determine you have developed stronger leadership? 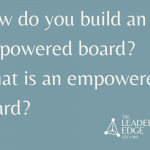 What results would you be seeing that demonstrate your leaders are leading more effectively? Answers to questions like these become the program expectations or goals. 2. Come to agreement on the goals with your internal or external provider. Make certain you both feel confident, given any constraints (time, money, internal commitment, etc), that you can achieve the goal. Once you have agreement, determine how these will cascade down into the learning and development program. Will each individual set a goal at the start of the program to achieve a 2 time return on investment? Will they set a development goal with a tangible and financially measurable outcome? Once the goals are set, determine how these will be measured; weekly evaluations, online tracking of goals or maybe the implementation of an action plan? 3. Create a strategy for developing the program to insure effectiveness. Your program content and learning approach need to be spot on. Internal champions should be identified to make certain the day to day support is in place for success. Identify the appropriate participants and make sure the composition of the classes or learning environment are appropriate. Position the program to be something special that will enhance the participants’ success, not an “add-on” to an already hectic schedule. 4. Insure your program includes relevant content, delivered over time and with high levels of accountability. The life science audience is smart, fast paced, incredibly busy and, shall we say, somewhat cynical. It is critical that any learning and development program that they participate in is highly relevant. That means the skills they learn can be applied immediately, that examples given reflect knowledge of the industry and the environment within which they work, and the facilitator has credibility, both on the learning topics and the industry. Now they are open and ready to learn. Research shows that the most effective approach to achieving behavior change, including the learning and implementation of new skills, is through spaced repetition. This means learning over time. This approach enables participants to learn new skills and concepts without feeling overwhelmed, it also gives them the opportunity to apply them in the workplace and then to be held accountable when they return to the next session. That leads us to accountability. Behavior change is hard. We all need help. For nearly 30 years, we have used a combination of goal setting, action planning and tracking, the use of peer coaches, learning pods, internal champions or mentors and unlimited lifetime support from our facilitators to our clients for no charge. This combination of support helps to provide an environment for overcoming barriers, encourages the sharing of best practices and gives everyone the opportunity to celebrate successes. 5. Create a plan to revisit the outcome of the Learning and Development program. Once the program is complete, review your results and determine how and to whom you will communicate your successes. Make certain that your key stakeholders are involved in this debrief, insuring there is a clear understanding of your return on investment, both financially and culturally. In completing the process, you will have demonstrated success and gained the support of your organization’s influencers and decision makers. 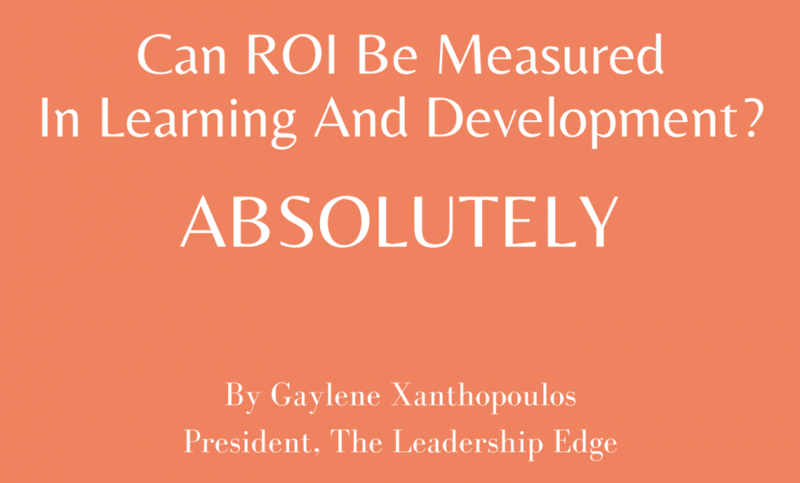 When these practices are put in place, you have laid the foundation for clearly demonstrating the business impact that effective learning and development programs will have on your organization. Whether you are providing coaching to a first time CEO, developing your executive leadership team, increasing the pace and quality of the work delivered by your teams or providing a newly promoted scientific manager with the tools and skills needed for success, the investment in your people will be seen as a smart investment in your company. 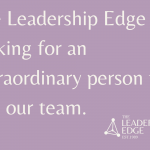 For nearly 30 years, The Leadership Edge has been the partner of choice for life science organizations, profoundly impacting the pace, performance and culture of the most innovative life science companies in the world.